The North Shore Inn on Lake Gregory: The hidden gem of the San Bernardino Mountains near Lake Arrowhead. Charming Boutique hotel lodging in a resort atmosphere. Lake Gregory / Crestline is only moments from Silverwood, Lake Arrowhead, Twin Peaks, Blue Jay, Running Springs & Big Bear. At The North Shore Inn, each hotel room provides affordable luxury accommodations & ambiance for your vacation lodging experience. Crestline Lake Gregory hotel lodging is more personal than a cabin, with all of the comforts of home in a hotel resort lodging area. At The North Shore Inn, our hotel rooms have gorgeous mountain views of Lake Gregory & Crestline that will take your breath away during sunrise or sunset! See Rooms & Rates for amenities provided in each hotel room. For dining ideas in the Crestline, Lake Gregory, Twin Peaks, Blue Jay & Lake Arrowhead areas while lodging at The North Shore Inn, see our Dining page. 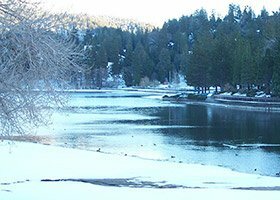 Gorgeous Lake Gregory in Crestline, CA, offers a variety of seasonal activities. To ensure our guests the best mountain escape experience, The North Shore Inn is only 8.5 miles away from Sky forest park @ Santa's Village. 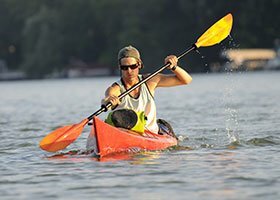 Offering Mountain bike trails, Bungee jumping, Zipline, Rock Climbing, outdoor Skating Rink & more Summer, Spring & Fall. Winter fantasy in Snow, Ice skating, Caroling, Shopping, Snow play & yes even Santa. Intimate dining & concerts for evening entertainment . Take a look at all the fun ! Skypark @ Santa's Village. While in Crestline, hike around Lake Gregory or watch nature from your private balcony. Maybe catch a glimpse of the Bald Eagles that frequent Lake Gregory. 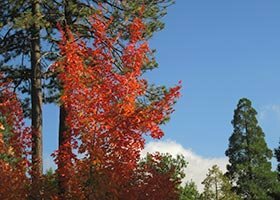 Crestline & the Lake Gregory area offer year-round fishing, horseback riding, hiking, mountain biking, zip lines, paintball, & many other seasonal activities. While staying at The North Shore Inn, you will only be a short drive to Snow Valley Ski Resort, Arrowhead Queen Boat Ride, Arrowhead Village, and even the Murillo Family Observatory - see our Activities page. The North Shore Inn is the only hotel lodging alongside Lake Gregory. As always to ensure while staying at The North Shore Inn we supply our guests with passes to get into Lake Gregory (call for us details). The North Shore Inn is also the closest hotel lodging to The San Moritz Lodge wedding venue in Crestline and only moments from Pine Rose Cabins, and Skypark Weddings. We are a short distance from most wedding venues in the San Bernardino Mountains, making the North Shore Inn the perfect hotel and resort lodging for romantic getaways, honeymoons or family vacations! For business hotel lodging that is not a cabin, The North Shore Inn, the luxury Lake Gregory hotel, will suit your needs. Only moments from Arrowhead, Twin Peaks & Blue Jay we will provide you with a wonderful hotel and mountain resort lodging experience - see our Business Travelers page. No matter the season, reason, or age The North Shore Inn is the best resort and hotel mountain lodging in Crestline, Lake Gregory & Arrowhead. 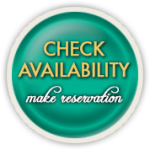 Check our Specials, Seasonal Rates, and Events Calendar for Crestline, Lake Gregory, Blue Jay, Lake Arrowhead & Twin Peaks.